Immortal Grapple (up to the Sabbat version) restricted strikes to hand strikes for the remainder of the combat, not only for the current round. Majesty didn’t cost blood during prior (to Camarilla Edition). Pulled Fangs inflicted aggravated damage (until Sabbat War). Golconda initially only burned the vampire, and did not remove it from the game. These are only a few examples, but it shows how important it is to know (or at least to check) the latest cardtext if you build a deck/strategy upon a specific card. DOM: “Only usable before combat begins. Baroken : Return to Innocence? 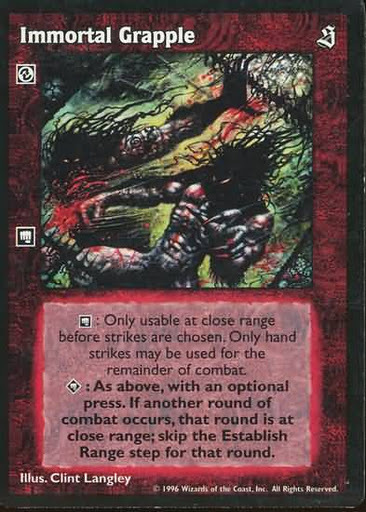 I still think that RtI could have been rewritten to a non broken playable card. For the concept does fit the game. Regarding Thoughts Betrayes: Now it is nearly wallpaper. It is very difficult to adjust and balance a card. Unfortunately in this case it didn't work out well. As an inexperienced player, I was recently shown the original “Misdirection”. I couldn't help to laugh out loud.